ATLANTA, June 26, 2017 – BasisCode Compliance LLC has been contracted by leading automated financial planning and investment service, Wealthfront, to upgrade the firm’s compliance management program with BasisCode’s software platform. 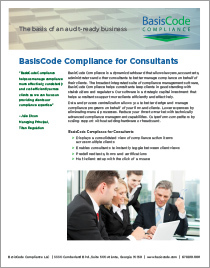 BasisCode ComplianceTM (www.basiscode.com) is the industry’s most comprehensive software that improves compliance management for financial firms, consultants, law firms and other service providers. 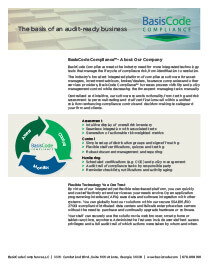 The software simplifies and centralizes compliance management, ranging from compliance testing and risk assessment to trading surveillance, insider trading and staff certifications. 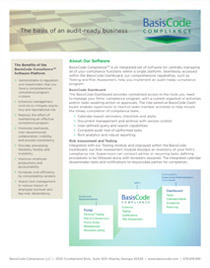 Wealthfront will implement BasisCode’s Essentials which is a core compliance management software suite that helps manage the risk lifecycle from identification to resolution. Essentials offers a basic set of management tools that simplifies management of the core elements of a compliance program and is ideally suited for organizations with simpler compliance management needs. The cloud-based system includes testing and certifications, risk assessment, gifts and entertainment, whistleblower, document portal, robust reporting and a portal for ease of use and seamless interaction with employees. Wealthfront will also be installing BasisCode’s Personal Trading ManagerTM that streamlines management and surveillance of employee personal trading. This highly sophisticated system increases compliance efficiency by eliminating labor-intensive, error-prone manual processes, while at the same time reducing regulatory risk. Personal Trading Manager also accommodates pre-clearance and post clearance, trade request analysis and employee-managed or direct feed brokerage options.